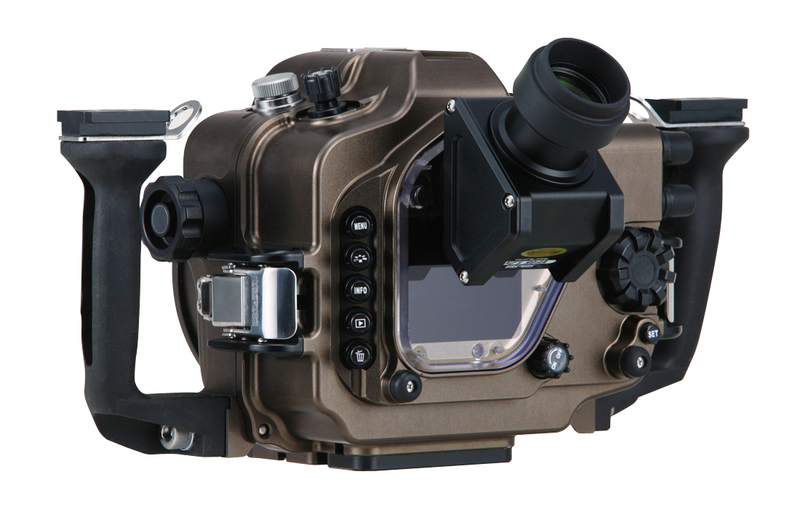 By attaching the VF180 1.2x or the VF45 1.2x prism viewfinder (magnification ratio of 1.2x) to a SEA&SEA housing, the magnification increases by 1.2x and entire field of view can be seen at the same time. Recommended for users committed to strict composition and focusing. Thoroughly pursued a unique structure where the fingers easily reach the main dial and the quick control dial. As a result, succeeded in moving the quick control dial closer to the grip than what is found in conventional models by adjusting the chassis within the housing. With a hand on the grip, snappy adjustment of the shutter / aperture can be made. An appropriate amount of clearance not found anywhere else realizes a high level of holding, which delivers an ideal shooting position. AE lock / FE lock / Index / Reduce / AF point selection / Magnify lever was also changed from the conventional slide-switching type to an up-down, combinable type. Of course, the reverse slant (diagonal) button from the original configuration is still around. Even more active functionality and styling are combined at high dimension. 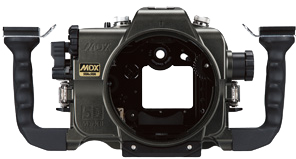 The new style of MDX series housings based on the premise of a professional level of photographic representation employs an even more aggressive design by integrating smooth curves and sharp edges. With the standard thickness of aluminum material being made even thinner than that of conventional models, we realized a reduction in size while maintaining rigidity. *The LCD image pictured here is simulated. Controls almost all of the Canon EOS 5D Mark II essential functions underwater. YS converter connector employed as standard. When using a YS Converter/C to enable the TTL auto adjustment, use a 5-pin Sync Cord/N to connect it to a genuine SEA&SEA strobe. The easily damaged front lower part is guarded by a bumper protector. *The MDX-PRO 5D Mark II housing comes from the factory with these type-N connectors: one 2-pin wired connector and one 5-pin wired connector.